Morning arrived and we were collected by a small Parama Tour mini bus and seemed to have a dedicated rep just for us – although this may also have been because they screwed up our tickets so we needed someone to help sort that at the dock. The boat company that Perama use are Mahi Mahi Dewata but there are a few other companies that use the same dock, which makes for amusing tourist people watching especially as the hawkers come out with their T-shirts, jewellery and dismantlable blow pipes! The crossing was only about 30mins as we stopped at Gili T first and we managed to get one of the few seats outside. You disembark at Gili T into chaos caused by tourists either getting off boats or milling about with their luggage waiting to get on one. We grabbed our bags before the handlers could drop them in the surf and head over to the main road, which is just a rough cart track on the main beach ‘strip’ of restaurants and tour operators. As we hadn’t been 100% sure on arrival dates we didn’t have a place booked for here, but I had been in WhatsApp communication with a guy called Mark that had 3 properties on the island. He did us a great deal as we’d got his details from the place we stayed in Sanur and said we could pick from his hotels or he’d help find us one when we arrived for our budget of 350k a night. We went to his main resort Aaliku bungalows to check in and his team member Tian knew about our arrival and said he could show us the options. As it turned out there was only one place that was free for the full 5 days and it was a lovely double room in Putra Boyen Bungalows, only 5 mins walk back from the seafront but we could have free run of the pool and bar facilities at Aaliku, as well as having breakfast served there every morning. It was perfect and the team that run all his resorts were friendly and helpful with everything from daily housekeeping, restaurant tips and football banter. After settling in we went for a wander and found a place for coffee and cake whilst we got the general feel for the place. 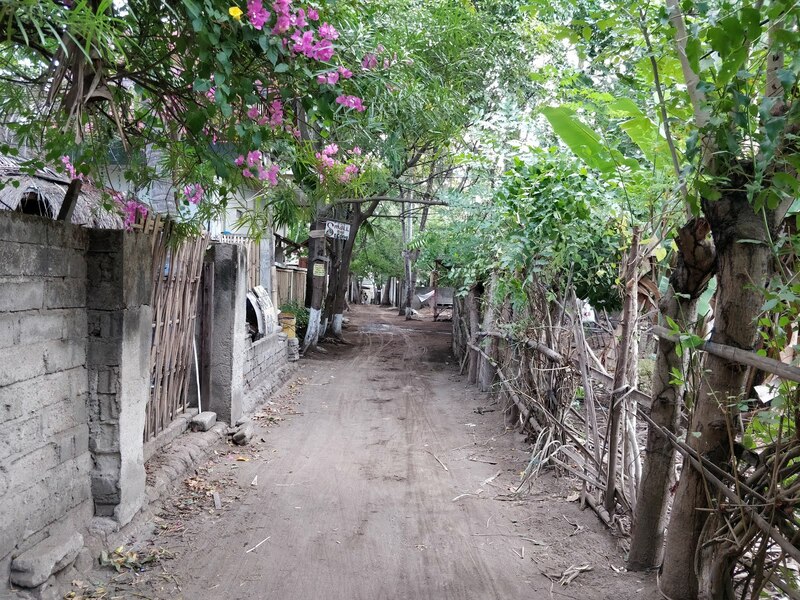 Gili T does not immediately feel like a beautiful holiday island. It’s dusty, a bit rough round the edges, there is a rubbish problem, you get loud noisy groups of tourists and it can feel very full on when you first get there but as you get used to the place it really grows on you. There is no motorised transport on the island, most people get about on push bikes but you can walk the entire island in a few hours. The locals have horse and carts to transport tourists and goods around the island, these ponies work extremely hard in the hot sun every day and we wouldn’t use them although I was pleased to see a lot of them had a good covering of fat on their bones, were bright eyed / glossy coated and had their feet well-trimmed. The boat docks on the east side of the island and it’s here you will find the main hub of shops, bars doing happy hours and restaurants. There is also lots of dive centres and tour operators dotted about for you to choose from and to the south you find the more expensive resorts. Unfortunately, I had come down with a horrid cold that made me snotty, tired and grouchy and the last thing I felt like doing was snorkelling, socialising, drinking or eating so we holed up reading and sorting pictures out from Flores for 24hrs whilst I sweated it out. We still managed to catch sunset over on the West coast, which was crowded but pretty. The lure of Turtles didn’t keep me away from the water for very long and by 8am the following morning we were up and in the water just off the north-east beach. 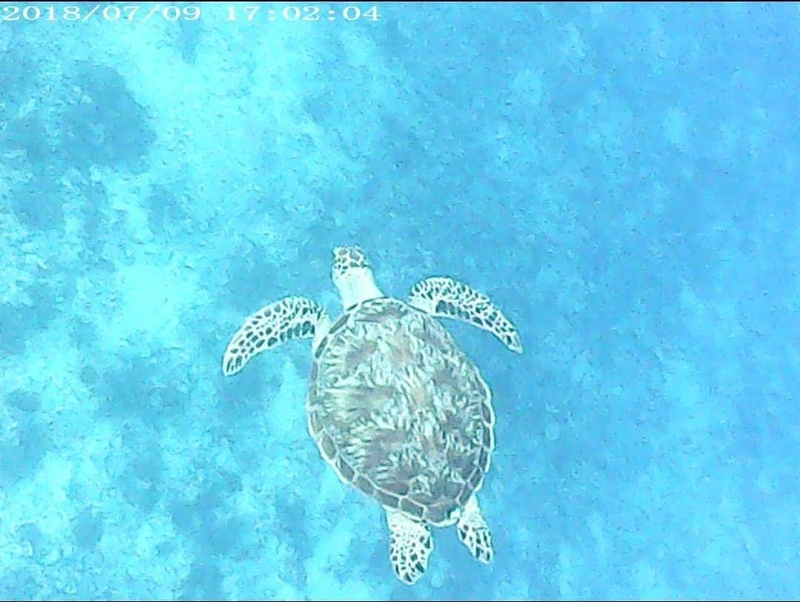 We saw our first turtle within mins of getting into the water but she was fast heading off into the deep and I hoped we’d see some more closer up. I needn’t have worried as they aren’t rare here and we saw another 3 just on that mornings snorkel. All were close enough that without too much effort we could have touched them and none of them seemed overly bothered that we were there. Obviously, the world cup was very much a thing in Gili with most of the big waterfront bars showing it on a screen of some description and as tonight was England v Sweden it was going to be a busy night. By 10pm most of the seafront venues had already sold out of large bottles of beer and they seemed to be frequented by shirtless, sweaty, boozed up English idiots but we managed to find a quiet corner and watched on the big screen as England won the match, before slinking off to bed. We had already decided to do the snorkel trip around the 3 islands, so when approached at the baby turtle conservation pools by a smooth-talking tout we got tickets that would do all 4 of the local snorkel sites, a stop on Gili Air, inc equipment and in a glass bottomed boat for 150k rph. I suspect you can get the same tour for only 100k but I hoped as we’d got it through the turtle conservation that they would get some of the money. 10:30 the next morning we and about 50 other people were eagerly waiting at the turtle pools and shortly after 11 they loaded 2 wooden boats full of people and off we went. I’m sure technically these boats are overloaded with people as there wasn’t seats for everyone and I certainly didn’t see more that 4/5 life jackets but no-one seemed that bothered so off we went. The first stop was an underwater sculpture that has been created by Jason DeCaires Taylor and will eventually become a manmade reef just off the coast of Gili Meno. As we approached the area what was apparent from the dozens of boats already there was how many other people were doing the exact same route around these sites and hence you would be in the water with hundreds of other people. Our guide came in the water with us and guided us through the maze of moving boats to an area literally mobbed with people. Peering under the water I caught glimpses of life-size human statues on the shallow sea bed in-between the legs of hundreds of tourists swimming above it. We struggled through to have a look but I was so fed up of bashing into people that I quickly left to swim about on the outskirts. 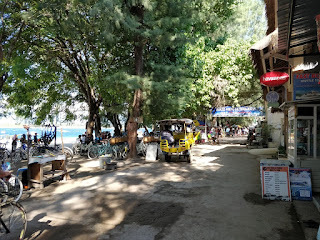 We then had a couple of stops near Gili Meno where we saw a few turtles, although they took one look at the hordes of people and headed off into the blue. At one stop which we think was turtle point we could see a group of scuba divers way down on the bottom, their air bubbles rising and catching the sunlight made it look like thousands of sequins in the water. I think between watching the schools of blue fish and getting lost in clouds of bubbles I got a bit distracted as the group got split up slightly. We still managed to see a couple of turtles swimming way below us and the boat didn’t lose track of its occupants, so no harm done. After collecting everyone we went all the way round to Gili Air, where very close to the shore is a small coral reef area that they call Garden Fish, the water is crystal clear and there are schools of brightly coloured fish but the fish are used to being fed and the whole place feels a little contrived. Next on the agenda was lunch at one of the Gili Air restaurants. Obviously, they take you to one of their mates’ restaurants and it just happens to be the only one in sight and the prices are with sky-high. We didn't buy anything but then had to wait for ages for everyone to get back on the boat. The last stop was meant to be the Bounty Wreck which is just off the south of Gili Meno but for some reason the boat captain just took us back the way we’d come and straight to the dock on Gili T. It was as we were getting off that we realised that they had never taken the covers off the glass bottomed boat! We decided to ask the captain and our ticket tout why this was missed but we were met with shrugs and lame excuses about waves. All in all, it was a disappointing day and I wished we’d just stuck to snorkelling from the beach or got a water taxi to the other islands. 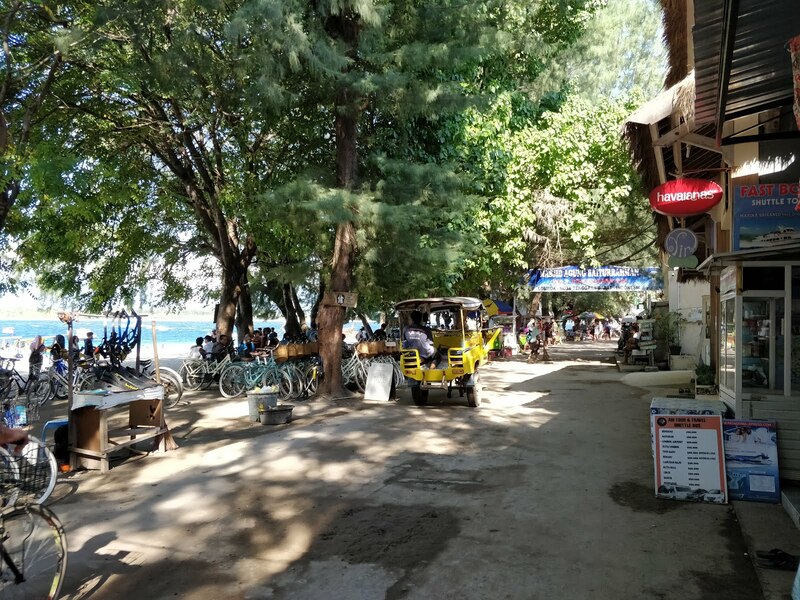 Aside from the disappointing snorkel trip by this time we had both fallen in love with relaxed Gili T and didn’t want to leave in a couple of days, so decided to rearrange the rest of our time in Indonesia to buy extra time on the island. Having negotiated another couple of days we decided to do something we’d been thinking about since Thailand and go Scuba Diving. I had taken my PADI Open Water back in 1995 but that was obviously way out of date, so we’d been eyeing up the Discover Scuba diving course you can do, which is a training session in the pool, then an ocean dive with an instructor. The cheapest and friendliest ones we’d chatted to were Buddha Dive centre, and so we decided to book in with them for the following day. 10am the next morning we were poolside at Buddha Dive, where we met Rosie who was also on the discover scuba course and Ovan our instructor. Although it was years ago that I’d done my course I was surprised how familiar the equipment and processes were and before we’d even got in the pool Ovan had us putting our own equipment together and safety checking our buddies. The pool session was busy and not an ideal way to learn the fundamentals of underwater breathing, but we all coped and did well enough that he was happy to take us out on a dive (a couple in another group weren’t so lucky) and so off we went. 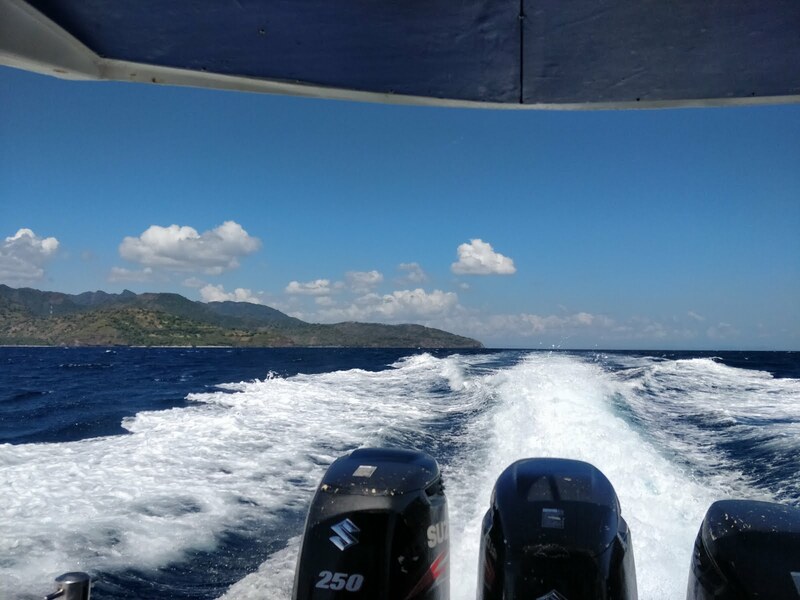 We walked ‘Gili style’ barefooted down the road to the boat where all our gear had already been loaded and soon we were speeding across the waves to Manta Point. We’d asked if there was a chance of seeing Mantas but apparently they are really rare and the best time to see them is Sept – Feb, most of the guides at Buddha dive had never seen them there so we didn’t hold any hope of finding one. After getting our kit on and getting in the water we descended to 12m, where we all had a bit of a shaky start with our neutral buoyancy – salt water is completely different to the freshwater pool. Soon enough we were swimming along a just above the bottom and what an amazing world we were in. We saw Puffer fish, Butterfly fish, Bat fish, shoals of bright blue fish, fish of every size and colour and several turtles it was truly amazing. We were nearing the end of our dive and I think Ovan had already started coming up procedures when he excitedly started banging on his air tank to get our attention. Gliding a short distance away was a huge Manta Ray! We were joined by 2 other divers and we all just watched as this magnificent ray lazily swam in front of us for what felt like ages. We were all working a little hard to stay in one place with the current, but she barely seemed to move her huge wings at all to move through the water. Everyone was on a massive high after that and we were the only boat of divers to see her that day, even though there had been at least another 2 boats full of people out there that morning. We felt very lucky. I already knew how special scuba diving was but I was really pleased to find that Paul loved it as well and so it didn’t take much persuasion by Ovan for us to sign up to get a Padi Scuba Diver qualification. This is halfway to being a fully qualified diver and was something we could add to if we ever wanted to continue with this hobby, but it meant a full day of pool and ocean diving the next day and wasn’t cheap for 2 – but as we still couldn’t find my old qualification details this was the only option available to us. The next day was all about building up more skills in the water, so that you would be comfortable in emergency situations like having no air, losing your mask, or having to remove your kit underwater. We got the pool to ourselves for this which was perfect and we all practised the skills we would be tested on when we got out into the ocean that afternoon. 2pm came and this time we were off on a boat to a dive site they call Shallow / Deep turbo. The dive was perfect, we all nailed our buoyancy from the outset and the reefs and sea life was staggering, we even saw a White tip shark slowly swimming by. There are so many turtles around the Gili islands that to be honest you wouldn’t realise that they are endangered, I lost count of how many we saw on that dive. After about half an hour Ovan found an old anchor rope that we could all hang on to whilst he went through the test with us individually. The first time I’d done these tests, back in 95, I’d been in Datchet Reservoir near Slough and now I was taking them in crystal clear water whilst two huge green turtles slept below me. It was so magical. Dives, quizzes, tests and practices all completed once we got back on dry land we collected our temporary scuba diver cards and left grinning from ear to ear. It was probably a good thing we hadn’t done this much earlier in our trip as we’d have blown all the budget on diving. That was our final night on Gili T but as the next England world cup match was kicking off at 2am and we both kind of wanted to watch it we had an early night and set an alarm for 1am. This time we headed to a smaller back street bar that had a big screen without all the drunken English idiots and to our surprise and delight most fans here seemed to be rooting for Croatia. The peace and good vibe was only mildly disturbed when a very drunk Scottish lass came in complaining about the rude English supporters down on the seafront, but she provided the half time entertainment as she recounted her story of thrown drinks to anyone that would listen and then plonked herself down to talk at some Croatian lads throughout the second half. England deservedly beaten we got back to our beds at 4:30am and crashed out for a few hours before the boat. Amazing that you got to see the Manta Ray, the most beautiful creatures I have ever seen diving. Jen and I are loving following the blog (apart from reliving the England defeat...although I agree it was desetved!) and checking it for tips for our next place. I think it will come in very handy for Java! Enjoy Vietnam and make the most of the ludicrously cheap beer. Safe travels Adam and Jen (Maumere to Ende). Hey guys, good to hear from you. The Manta was beginners luck at diving, we got the bug though and will probably do more here in Vietnam. Hope you're trip is going well and any questions on Indonesia, just ask.